Chilling body stone and a relaxing, pleasant social high. Little Dwarf Auto Seeds Review. Neither Skunk nor White Widow genetics needs much alteration, being the ultimate masterpieces on their own. In order to create a related autoflowering strain, however, Zambeza Seeds have crossed both with the fast growing Cannabis ruderalis. The new feminized autoflowering variety, similar in heritage to their Rude Bud, became a sort of Marijuana bonsai tree, so they call it the Little Dwarf. Living up to its name, Little Dwarf is a small and compact bush. Its restricted size and unique, close structure makes it a perfect choice both for indoor cultivation, as well as outdoor undertakings where space is limited. It was born from crossing the best autoflowering Cannabis varieties with a beautiful skunk girl, mixed again with the autoflowering parent plant, which allowed it to keep the desired autoflowering characteristics. 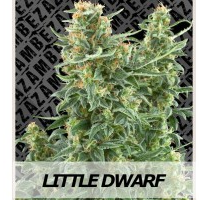 Compared with other autoflowering strains, Zambeza Seeds Little Dwarf produces slightly higher yields of approximately 40 grams per plant, thanks to its Skunk trait. What it also kept from its Skunk predecessor, is an exceptionally strong flavor and tight buds that quickly get covered in resin. Powerful yet tiny, Little Dwarf reaches its average height of 50 to 60 cm in no time – you can schedule harvest on just 8 to 9 weeks after planting the seed. The smoke, average in THC and CBD, quickly gets you stoned just as good as the old school Skunk strains. Compact and with little maintenance required during cultivation, it provides a chilling body stone and a relaxing, pleasant social high. Great choice for growers willing to give autoflowering varieties a try.